The city of Agra was founded by the Mogul Emperors who made it their capitol for more than a hundred years in the 1500's and 1600's until Aurangzeb, the 6th mogul emperor transferred the seat of the monarchy to Delhi in 1658. It was in Agra that Akbar received a letter from Queen Elizabeth I of England and Jahangir issued a charter to the British East India Company in 1612, granting it freedom to trade in India. The story of the Agra Diamond begins in 1526 when Babur the first Mogul emperor (1483-1530) took possession of Agra after defeating the Rajah of Gwailor in battle. Babur was the son of Omar Sheik, King of Ferghana (now Turkestan), his real name was Zahir al-Din Muhammed, but he was given the name Babur, meaning 'the tiger.' He was both a brilliant soldier and scholar, determined to become absolute ruler in India. After his success on the battlefield, Babur sent his son and successor, Humayun, to occupy Agra, a feat he duly accomplished in the process capturing members of the family of the slain Raja. Their lives were spared. It is said that as an expression of their gratitude they presented their captors with jewels and precious stones. Since it is recorded that Babur wore the Agra Diamond in his turban, the stone was probably one of those jewels. The officers decided to smuggle the diamond home to England rather than give it up, and share the proceeds, but the question arose as to how to get it there. Nobody seemed to be able to suggest a way that would prove successful until the evening before the departure of the regiment. During the course of the dinner the youngest subaltern suddenly jumped to his feet and said "I have it. We will conceal the diamond in a horse ball and make the horse swallow it." The plan met with general approval. A ball was secured, the inside scooped out, the diamond inserted and the end stopped up. Finally the animal was made to swallow it. When the regiment reached the port of embarkment, the horse was taken ill and had to be shot. The diamond was then removed from its stomach and taken to England. There seems to be no reason to dispute the truth of these events, what would be the purpose of creating them? However there is reason to cast doubt upon the date it is said the events took place. It is known that by 1844 the Agra was already in the possession of Charles, Duke of Brunswick, one of the great jewel collectors of the 1800's, the man for whom the Brunswick Blue Diamond is named. The Duke of Brunswick paid 348,600 French francs (equal to about £13,670), a high price, for the Agra Diamond on November 22nd, 1844, to Blogg, a name which appears in the 1860 catalogue of the Duke's jewel collection. The person was most definitely George Blogg, a partner in Blogg & Martin, a well-known firm of diamond merchants in London at that time. In addition the Duke bought three other diamonds from Blogg that same day and had previously bought four more from the same source on November 8th. A note in the catalogue specifically drew specifically mentioned the diamond having been taken by Babur in Agra in 1526 and to its rank as being equal to 14th in importance among the world's great diamonds. In the normal course of events it would be odd to expect a serving officer to possess a detailed knowledge of precious stones, but on the other hand accuracy would certainly be expected of the person compiling a catalogue of a gem collection in the calibre of the Duke of Brunswick's. One can only conclude, therefore, that the diamond eating by the horse and subsequently smuggled to England was not the same stone owned by the Duke of Brunswick, unless Lord Donegall's memory had failed him and the account he had retold to Streeter referred to happenings prior to 1844. Possible proof of the existence of two separate diamonds is supplied by other writers who have stated that the smuggled stone weighed 46 carats rather than 41 carats. While the Agra was in Streeter's possession, February of 1895, it was featured in a lawsuit that captured public attention. One London newspaper called it the "Extraordinary Jewellery Case." Certainly some of the allegations about the plaintiff, a young man named Joseph Charles Tasker, suggested that he was a true person of the prevailing fin de siècle decadence. Indeed the ties between fact and fiction were further cemented because counsel for the defendants, Messrs Streeter & Co., was none other than Sir Edward Clarke who, less than two months later, was to appear for Oscar Wilde at his famous trial. By the time he came to retire from the Bar, Sir Edward must have acquired a considerable degree of knowledge of historical diamonds because he also appeared for the owner of the Hope Diamond in further litigation in July, 1899. In opening the case to the jury, Tasker's counsel, Mr. Finlay, said that the action had been brought for the purpose of having certain alleged purchases made by his client declared invalid and set aside. Tasker was a 25-year-old gentleman who, a few years earlier, had inherited a fortune of £700,000 from a relative. In today's inflated currency, this would easily equate to $4 or $5 million. On May 21st, 1894, Tasker, in company with his former tutor, Baron von Orsbach, went to Messrs Streeter's shop for the purpose of seeing a model of the Holy City set in jewels. While there he was introduced to a Mr. Rogers who in later transactions, the jury would find acted as a canvasser for Streeter's. For the next three weeks Rogers seemed to have devoted himself to Tasker, lunching with him, dining with him, and being constantly in his company. At that time the plaintiff was in bad health due to his intemperate habits, and very often had to pass much of his time in bed. Mr. Finlay said that whenever Rogers saw Tasker he showed Tasker expensive gems which it was alleged by the defendants, the plaintiff bought. Within three weeks £100,500 worth of gems were alleged to have been purchased. 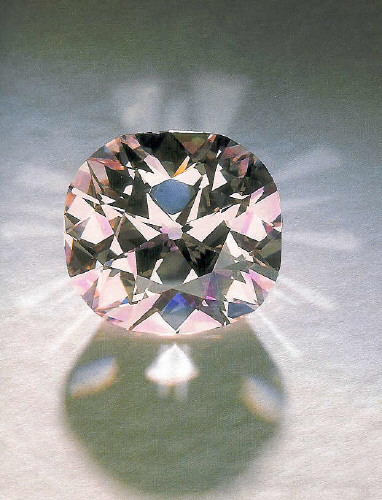 Furthermore Rogers showed Tasker the Agra Diamond, Tasker allegedly bought it for £15,000. Rogers also showed him a model of the Hope Diamond, saying that Streeter's would get it out of the Court of Chancery, where it was, and sell it to him for £32,000. The plaintiff agreed to buy it at this price but ultimately the transaction came to nothing. Counsel then produced two "experts" in court to give their opinions concerning the value of the Agra. A Mr. Jones who said he was a dealer in precious stones valued it at £8000 while a Mr. Spink valued it at £10,000. After the judge had overruled his submission that there was no case to go before the jury, Sir Edward Clarke addressed the jury. Sir Edward said that when they considered the way in which this had been launched and the way in which it had been conducted he did not doubt that they would think that no more unfair way of getting a bargain could be devised then that adopted by the plaintiff of traducing the tradesman with whom the bargain was entered into. This was a most serious attack on Streeter and his employees. The case they had come to meet was that they had made a false representation and by it the plaintiff was induced into these contracts. An attempt had been made to shrink the charge of misrepresentation, and to say now that the plaintiff was not capable of entering into any business transactions owing to his drunken habits. He was, however, surrounded by people who would have protected him if he was being attacked in an unfit condition. Could Baron von Orsbach taken a man, incapable due to drunkenness to Messrs Streeter's on the occasion of the exhibition of the Holy City? Turning to the Agra Diamond, Clarke said that its purchase was not done in a single day. The bills in payment for it were brought ready-drawn because the bargain had been made the day before. It true that Mr. Streeter, instead of giving actual money, had given jewelry (the pearl necklace) worth £14,000 for the diamond, but by doing this he said that Mr. Streeter was quite justified in saying that the diamond had cost him £14,000. That was not misrepresentation. The plaintiff had made this bargain and now wished to get out of it. It was arranged that he should pay the bills. When Mr. Rowe and Mr. Rogers, two employees of Streeter & Co. went to the hotel there was no undue haste or secrecy. The plaintiff's cousin looked at the bills before they were signed. He submitted that there was no ground for saying that the defendants had taken advantage of the plaintiff or made any misrepresentations. Sir Edward then drew the jury's attention to the difference in the value of the jewels in dispute given by the two experts called on behalf of the defendant and said that he would call others. Later during the proceedings they turned to be a Mr. Dodd, a diamond merchant who stated that he had thirty or forty years' experience in the trade. He considered that a stone the size of the Agra was unique because of its rose-pink color and that £15,000 was a fair price for a collector to pay. He was followed by a Mr. James Amos Foster of Holborn Viaduct, a wholesale diamond merchant with 25 years experience. In his opinion the Agra was a pink-white stone of very unusual size; he had seen it seven years prior in Paris when the price of the stone was £20,000. It was a stone that would be saleable for the occasion of a coronation or royal wedding. It would fetch anything from £14,000 from £20,000. Sir Edward Clarke: "Is there only one Babur?" Mr. Finlay: "Only one Babur, founder of the Mogul Empire, and only one Mr. Streeter." Mr. Finlay: "Was he a Frenchman?" Mr. Streeter: "An Indian Prince I should imagine from his name, but as I did not live in 1665 I cannot tell you." Mr. Finlay: "Did Hertz marry into the family of Nadir Shah?" Mr. Streeter: "I do not know anything about Nadir Shah." Mr. Finlay: "Is Mr. Hertz a very old man? Because Nadir Shah died in 1747." Mr. Streeter: "He is about as old as myself." The Agra remained in Streeter's stock until he retired from the business in 1904 when his successors, the Parisian firm of jewelers, La Cloche Frères, who had acquired the premises and stock through the United Investment Corporation, dispersing the contents. Many of the lower priced items were bought by Debenham & Freebody. The remainder, comprising the more valuable items, were put up for sale by Christie's of London. The sale took place on February 22nd, 1905. The Agra, as the highlight of the sale, was the final lot. It was described as a "magnificent rose pink diamond of the highest quality, weight 31 and 13/32 carats." Although no name was attached to the diamond, it was obvious it was the Agra Diamond. The Times reported that the sale attracted a large crowd of people including a number of Indian collectors. The bidding opened at 1000 guineas and at 5100 guineas was knocked down to Mr. Maz Meyer of Hatton Garden, with Mr. S. Harris as the underbidder. Four years later, on June 24th, 1909, jewels belonging to the dealer Salomon Habib came up for auction in Paris. They comprised of eight items: the fifth was the Idol's Eye and the eighth was the Hope. The sixth was a cushion-shaped rose-colored diamond weighing 31.50 carats; it had a reserve price of 300,000 francs put on it but reached only 82,000 francs. No name was attached to the stone but it is hard to believe that it could have been any other diamond than the Agra. Shortly afterwards the gem was acquired by Mr. Louis Winans. He had inherited a fortune from his father, William Walter Winans, an American railroad engineer from Baltimore who built Russia's first commercial railway from St. Petersburg to Moscow. It was in 1843 that Czar Nicholas I (1825-1855) invited George W. Whistler, half-brother of the artist James McNeill Whislter ("Whistler's Mother"), to be the consulting engineer on the proposed railway linking these two cities. Whistler in turn asked Ross Winans, a leading engineer and inventor to take charge of the mechanical department. Winans, however, declined the invitation and sent his sons William and Thomas instead. The Winans brothers' contract was to equip the new Russian railway with locomotives and stock cars and in so doing they established workshops in Alexandrovsky, near St. Petersburg. When the railway was completed in 1851, Thomas Winans returned to Baltimore with his Russian wife while William Winans stayed on until 1862 to finish existing contracts. In 1868 the Russian government took over the family's interest in return a large bonus. Louis Winans eventually settled in Brighton, England, where he commissioned a local firm of jewelers, Lewis & Sons to help form his remarkable collection of colored diamonds. The Winans collection included some spectacular stones - besides the Agra Diamond, which was the highlight, the Golden Drop weighing 18.49 carats was part of the collection. It is one of the most intense and pure yellow diamonds of its size ever known. The Agra and two other diamonds from this collection were put up for sale at Christie's in London on June 20th, 1990, by the vendor who had inherited them in 1927. During World War II, she had commissioned her local blacksmith to make an iron box and into it she placed the Agra Diamond along with all her jewels and colored diamonds inherited from Louis Winans. This casket was buried in her garden and was still safely in place at the end of the war. The Agra was graded by the Gemological Institute of America as a naturally colored Fancy Light Pink, VS2 clarity diamond. It measured 21.10 by 19.94 by 11.59 mm and weighed 32.34 carats. It was expected to fetch £1,500,000 but after fierce bidding it sold for £4,070,000 (about $6.9 million). The winning bid was made by telephone and came from the SIBA Corporation of Hong Kong, the same company that owns the Allnatt Diamond. The total value of the gems and jewelry sold at this record auction was £12,900,000. Since that appearance the Agra has been recut to a modified cushion shape (and judging by photos, most likely a stellar brilliant cut) weighing 28.15 carats. Sources: Famous Diamonds by Ian Balfour, Diamonds - Famous, Notable and Unique by GIA, and the Gemstone Forecaster.